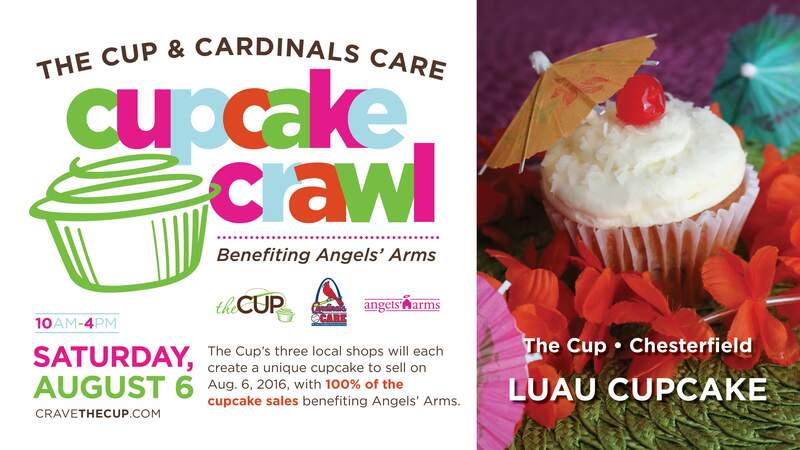 On Aug. 6, have your cake and help local kids, too, during The Cup & Cardinals Care Cupcake Crawl. Customers are encouraged to visit all three of The Cup’s locations — in Chesterfield, the Central West End and Edwardsville, Illinois — to purchase a signature cupcake in support of Angels’ Arms, an organization that provides and supports loving homes for foster children by keeping brothers and sisters together within a nurturing family until a forever home is found. “The Cupcake Crawl is going to be such a fun event and a great opportunity to engage St. Louisans in our company’s commitment to bettering our community through baking,” Ericka Frank, owner of The Cup, says. The Cup and its presenting partner, Cardinals Care, are both committed to benevolent giving and have established several programs and partnerships with charitable organizations throughout the region to express its dedication to and support of its various communities. Last year, The Cup organized the St. Louis Sweet Tooth Tour, in which 13 area bakeries banded together to raise funds for Operation Food Search’s Operation Backpack program. Meanwhile, Cardinals Care, the St. Louis Cardinals’ community foundation, works year-round to make a positive impact on area youth. ● The Buckeye, featuring a peanut butter cupcake topped with peanut butter frosting, chocolate ganache, peanut butter glaze and chopped peanuts. Available at the Central West End location (28 Maryland Plaza Rear, St. Louis, MO 63108). ● The Luau, featuring a pineapple and strawberry layered cupcake topped with coconut buttercream, shredded coconut and a maraschino cherry. Available at the Chesterfield location (1590 Clarkson Rd., Chesterfield, MO 63017). ● The Bananas Foster, featuring banana rum cake filled with a cinnamon-spiced banana pudding, frosted with cinnamon cream cheese frosting, chopped pecans and a drizzle of cinnamon caramel sauce. Alcohol free. Available at the Edwardsville location (1057 Century Dr., Edwardsville, IL 62025). Customers who visit all three locations on Aug. 6 can enter to win some fabulous prizes, including tickets and field passes for a St. Louis Cardinals game.